If you frequently feel bloated, have diarrhoea or constipation or alternate between the two, you may be suffering from undiagnosed irritable bowel syndrome, commonly known as IBS. Many of the symptoms for IBS are similar to other conditions so it can often go undetected, whilst you suffer unnecessarily. In this article, we discuss what IBS is, what causes it and how you can actively reduce your symptoms. What exactly is IBS and what causes it? This is not heartening news but it can be helpful to know that you are not alone and what's more there are ways to deal with IBS that don't necessarily mean you have to take medication for the rest of your life. IBS is a condition classed as a 'functional gastrointestinal disorder'. Current thinking is that in IBS sufferers there are problems with how the brain and gut work together. This causes changes in gut motility and make your gut more sensitive. 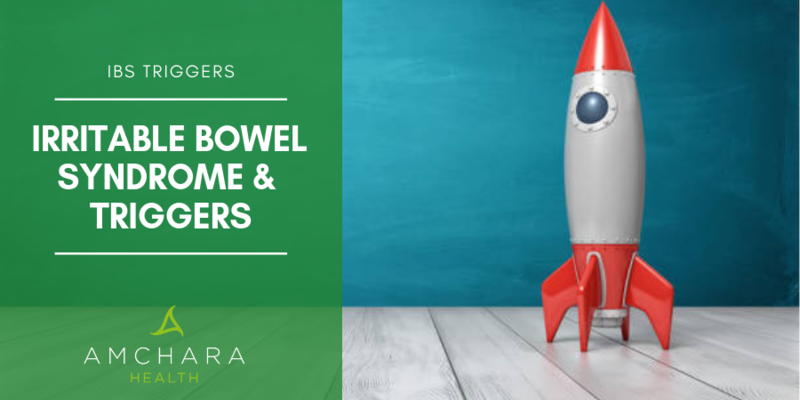 IBS is often mistaken for other conditions, such as inflammatory bowel disease, coeliac disease, appendicitis or even food poisoning, which all possess similar symptoms. For this reason, it is important to seek a medical opinion, as although IBS cannot be diagnosed via testing, it is possible to eliminate other more serious conditions. IBS is characterised by abdominal pain or discomfort. Some individuals report strong abdominal pain together with episodes of constipation or diarrhoea, whereas others may experience urgent bouts of diarrhoea occurring frequently after meals and yet suffer no pain at all. The unpredictable nature of IBS can be extremely debilitating and frustrating affecting the quality of life for many sufferers. Several factors can trigger IBS, so it is important to primarily identify what yours are before planning a strategy to prevent or manage the symptoms. A significant amount of research has identified that stress can not only trigger the condition but can also worsen symptoms. Stress may be down to work, family or relationship issues and can disrupt the digestion. During stress, the automatic nervous system redirects energy away from other bodily functions, such as the digestion, to areas that need it more. For individuals with chronic stress, IBS symptoms are more likely to develop. In these circumstances, it is crucial to find ways to de-stress. Certain techniques are known to reduce stress such as yoga and meditation. Food intolerances are commonly associated with IBS. Symptoms can intensify when offending foods are consumed, such as gluten or lactose. Some research suggests that in certain individuals an excessive intake of highly fermentable, poorly absorbed short chain carbohydrates and polyols (FODMAPS, may be a key factor in IBS. This includes not just lactose and polyols but also galactose, fructose and fructans. These types of short chain carbohydrates are very rapidly fermented by the bacteria that resides in the gut which can generate uncomfortable abdominal symptoms. Testing is highly recommended for those who suspect they may have a food intolerance. An overgrowth of unhealthy bacteria in the gut can lead to an imbalance in the gut flora (dysbiosis), which can trigger symptoms. Gut dysbiosis is commonly caused by antibiotic use, stress and a poor diet high in sugar and processed foods and lacking in fibre, fruit and vegetables. Parasitic infections can be caused by consuming raw or undercooked meat and fish, insect bites or contaminated unwashed fruit and vegetables, as well as tainted water. There are a range of non-invasive tests that can identify an infection of this type. One should consider that reactions to foods can vary significantly between one person and another. It is vital to avoid any food allergens or intolerances that have been identified as culprits. Exclusion diets can significantly improve symptoms in individuals with known allergies or intolerances. The severe restrictions of this type of diet can be difficult to stick to so it is recommended in these instances to seek the support of a qualified nutritionist or naturopath. Eating too much or too late in the day can also disrupt gut motility. Routines and eating regularly can make a significant difference. Individuals with IBS frequently suffer from poor nutrient absorption so it may be necessary to supplement with a multivitamin and mineral for general health and well-being. In IBS the body is said to produce fewer digestive enzymes, which are essential for nutrient absorption. Digestive enzymes can be helpful to help digest problematic foods such as spices and fatty foods. If these remain in the gut undigested it can cause fermentation in the digestive system which results in bloating, cramps, wind and diarrhoea. Naturally bitter foods help to stimulate the digestion, by increasing saliva and stimulating enzyme production. It can help to include foods like rocket, radicchio, endive, apple cider vinegar and citrus fruits like grapefruit. The addition of probiotic foods can be very beneficial. These include live yogurts, some cheeses, fermented foods such as kefir tofu, miso and kimchi. Probiotic foods help to rebalance the bacteria in the gut and thus ease the symptoms of IBS. Ginger is known for helping to calm the gut. Studies have shown that Ginger influences pain and bowel movements, thus ginger may be useful in reducing both pain and stool changes in IBS. Trials using artichoke leaf extract reported a significant improvement in IBS symptoms. This plant extract was seen to normalise gut motility and reduce bloating as well as relieve distension and abdominal pain and cramps. The anti-spasmodic effects of peppermint are well known in traditional folk medicine. Extracts have been studied in a number of clinical trials. The results from these show a significant reduction in abdominal pain and severity. Aloe Vera helps to maintain bowel regularity without creating diarrhoea and has been shown to reduce abdominal pain/discomfort as well as flatulence in patients with constipation dominated IBS. Turmeric is a powerful anti-inflammatory, and for this reason there is great interest amongst complimentary health practitioners, for its use as a therapeutic tool in IBS. Both of these minerals have been found to manage some of the symptoms of IBS. Calcium has a binding effect, so can be useful for those suffering with diarrhoea, whilst magnesium relaxes the muscles, which is helpful for those suffering with constipation. Research has produced conflicting opinions regarding fibre consumption and IBS. Some scientists say that fibre can be beneficial whilst others believe it can make symptoms worse. However, there is strong evidence that soluble fibre, the type that is found in oats, flax-seeds and some fruits like apples and berries - as opposed to the insoluble fibre in foods like bran and whole-grains can benefit those with IBS. Regular exercise is particularly helpful for IBS sufferers. Exercise stimulates natural muscle contractions, which help to stimulate bowel movement and may make a considerably difference to those with constipation. If you are uncertain about whether you have IBS, in the first instance see your GP to rule out any other potential gut conditions. In the meantime, it’s worth testing for food intolerances. Once you know more about your condition, you can get started on improving your symptoms and getting back to normal. Amchara can offer a comprehensive food intolerance test, which entails a simple pinprick blood test and can also put you in touch with a qualified naturopath who can guide you through any dietary changes you may need to make.